This website started out on January 1, 2010 as a daily photo blog, and after 2 years and three months, I decided to expand it beyond my photography to include my design, illustration, and crafts as well. The name of this blog comes from the original purpose, Photography and the Okapi. The reason I chose an okapi is simple. They are not necessarily the most beautiful, best, or well-known animal in the world, but they are unique. I consider my photography, design, and crafts to be the same; unique. I hope you enjoy what I have created and I welcome your comments. 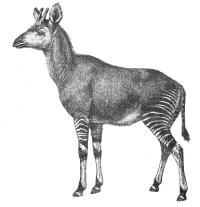 The Okapi (Okapia johnstoni – pronounced Oh – kah – pee) is a mammal native to the Ituri Rainforest, located in the northeast of the Democratic Republic of the Congo, in central Africa. They are striped on the hindquarters like a zebra, but are actually related more closely to giraffes. There are approximately 10,000 – 20,000 in the wild.